Lock QuickBooks company file to make changes. Sync changes and release lock automatically. Other users can simultaneously open the file to view transactions or run reports, but their changes will not be synced. Files remain on shared user PCs so QuickBooks performs at its best. Setup Regular sync folders to share files continuously and collaborate in real time. Or setup Custom sync folders to share files only when needed. As an example, use Custom sync folders for your tax only clients whose files need to be accessed only once a year. Qbox costs less than $9 per month for each client. Simply setup QuickBooks company working files (QBW) in a client folder and share with your client users. There is no limit on the number of users, number of files or file size. There is no more need to use cumbersome Remote Access. No need to send QBW files as email attachments or on Jump drives. No need to drive to client locations to work on their QuickBooks files. 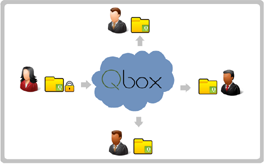 Qbox is hosted on Amazon data centers with security standards used by banks to protect data files. Data transfer & storage are encrypted with AES-256 keys.